New installation of Ubuntu 17.10 with ISO from 20171015. When Ctrl+C is entered the system restarts. Installation from the "live session" is working OK.
Had this problem after installing Ubuntu Budgie ISO 20171017.1 (auto-resize). 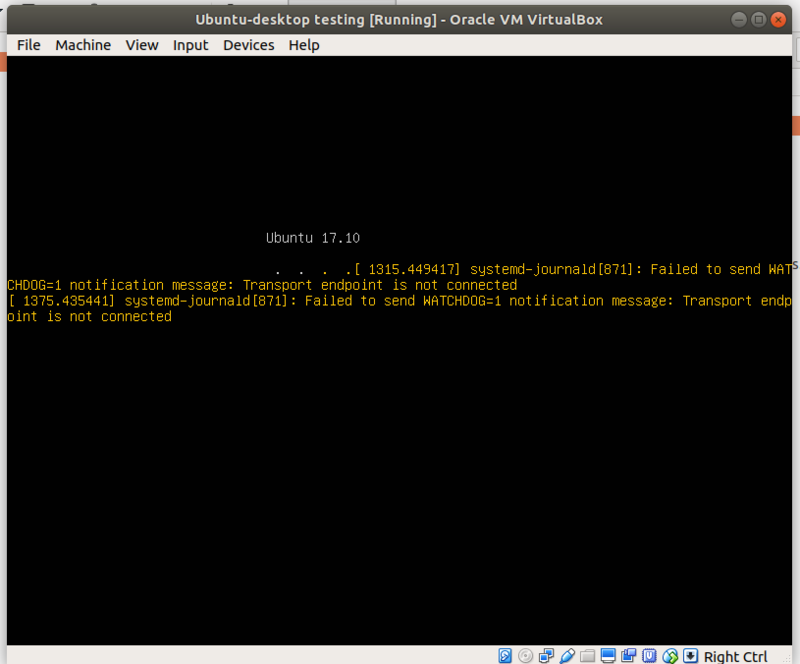 As I was using a Vbox VM, I just forcibly shut down the VM and started it again. The install itself was fine. I had previously done a manual install using the exact same ISO file. I don't know why one should reboot correctly and the other not do so. Seems like this is more likely to be casper (or plymouth) than ubiquity. Reassigning. Ubiquity has already stopped at this point. If you hit Control-C; it's happy and will reboot, but still won't show the Enter prompt. Managed to reproduce this on a Vostro V130. I'll dig in to see if I can find the exact cause, but I suspect the "caching" that we do when we're about to reboot to break down somehow. After installing Ubuntu 17.10 http://cdimage.ubuntu.com/daily-live/20171018/artful-desktop-amd64.iso on virtualbox, VM did not reboot after pressing Enter at the end of the installation process. I had some errors that could be seen, see attached image. I am attaching logs from /var/log/installer directory, if of any help. Any updates on this bug report? I don't think I'm seeing this issue with QEMU/KVM. I haven't seen this when I have followed the 18.10 and 19.04 development. I no longer see this issue with Virtualbox and Xubuntu either. I'm removing it from our release notes.